Dr. Michaël R. Laurent, MD PhD, received his training in internal medicine and geriatrics at the University of Leuven, Belgium (KU Leuven). He received a PhD Fellowship from the Research Foundation Flanders (FWO) and worked at the Laboratory of Molecular Endocrinology for his PhD project entitled “Male osteoporosis: role of androgen bioactivity and mechanical loading”. He is a consultant at the Leuven Centre for Metabolic Bone Diseases, and coordinator of the care program for rare bone diseases at the University Hospitals Leuven. He currently works at the geriatrics unit of the Imelda general hospital in Bonheiden, Belgium. 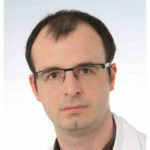 Dr. Laurent is a member of the Board of the Belgian Bone Club, and a member of the ASBMR, the ECTS and the Belgian Ageing Muscle Society and has received young investigator awards from the ASBMR, ESCEO and the Belgian Society for Gerontology and Geriatrics. He is an avid reviewer for several bone journals and an Editorial Board Member of Frontiers in Pharmacology and WikiJournal of Medicine. He has authored or co-authored more than 50 international peer-reviewed papers and book chapters.